You can tell a lot about a person based on the type of bumper stickers they slap on. But there comes a time when you may outgrow those sticky statements, and too many of them can certainly look tacky. 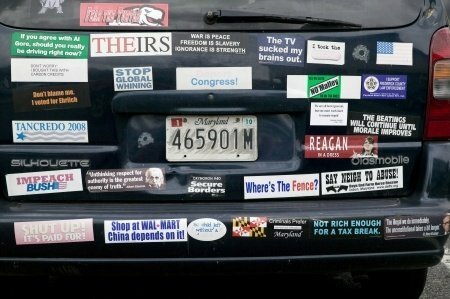 If you’ve ever tried to remove bumper stickers from your car, you’ll know it is not always the easiest thing to do. In fact, you may even dread the thought of having to remove your bumper stickers. Not to worry, because bumper stickers don’t need to be permanent any longer. With a few helpful hints we’ve compiled below, you will quickly learn the best methods — and things you shouldn’t do — for removing your bumper stickers. Heat: First, bumper stickers are easier to remove in the summer. This is because heat helps break the sticking bond. To turn up the heat, try using boiling water, or even a hair dryer for 30 seconds to one minute (six inches away from surface). Homemade solutions: There are solutions you can easily whip up at home to help remove bumper stickers. The first is dipping a towel in vinegar and soaking the bumper sticker. You can also try applying rubbing alcohol, dish soap, and even a bit of WD-40. Goo-gone: At your nearest hardware or convenience store; Goo-gone is also a simple solution. This will help break down the sticky adhesive. Let soak for a few minutes before wiping the area clean. Use a razor. Some websites may suggest using a razor to remove a bumper sticker, but how is this any different than essentially keying your own car? You don’t want to risk scratching your bumper. Instead, use a credit card, or a knife wrapped in duck tap. Remove all at once. Instead of trying to rip off the sticker like a band-aid, you’re better off going for the corner. Try getting the corner to come loose, and see if you can peel it off gently. Forget to clean afterwards. Even after you remove the sticker, you should clean the area with soap and hot water. This will remove any access adhesive and pesky parts that are difficult to remove. *Article provided by DentGoalie.com. Our car door guards applied while parking, help keep your car spotless and dentless on the outside. Recently featured by AAA, DentGoalie car door guards are flexible door ding protection panels, applied when parking, with a patent-pending design delivering very broad protection. Made of high density impact resistant EVA foam with rubber coated magnetic strips, and a security cable to deter theft of the panels. Two sizes are available and these car door panels are universal for use on all vehicles. More info can be found at: www.dentgoalie.com.